Complimentary bikes a shared kitchen and a Commercial Street location that can't be beat help you explore Provincetown from the Moffett House Inn.Set in a one-story Cape all 10 rooms include mini-fridges TVs with DVD players and air conditioning; some baths are shared. Pick a DVD from the inn's movie library and take advantage of Wi-Fi and a public computer. Prepare snacks and meals in the guest kitchen and unwind in the private outdoor cedar shower. Park on-site and take advantage of the inn's free bicycles. Note: Front desk hours vary. Guests planning to arrive before or after the designated check-in time must contact the property prior to arrival for special instructions. Guests can contact the property using the number on the reservations confirmation received after booking. 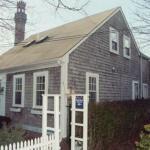 Located on busy Commercial Street the Moffett House is within walking distance of favorite attractions in Provincetown. Stroll one block to board a whale-watching cruise from MacMillan Wharf and two blocks to Pilgrim Monument. Beech Forest bird watching is one mile away and Race Point Beach is 10 minutes away. Stroll a half-mile past dozens of shops restaurants and galleries on Commercial Street to the Provincetown Art Association and Museum. Cape Cod National Seashore is 20 minutes south. Provincetown Municipal Airport is three miles away and Boston's Logan International Airport is 120 miles away.